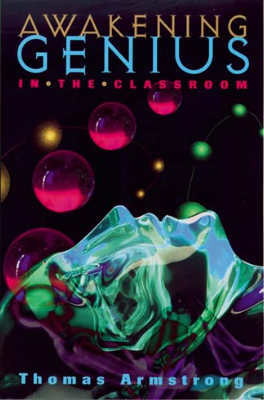 This Study Guide is designed to enhance your understanding of Awakening Genius in the Classroom, an ASCD book published in July 1998, by helping you make connections between the text and the classroom, school, or district in which you work. Written by Thomas Armstrong, this book inspires teachers to find the genius in each of their students. You can use this Study Guide before or after you have read the book, or as you finish each chapter. If you have not read the book already, you may wish to scan this guide very quickly and highlight questions and instructions that are designed to prompt your thinking prior to your reading the text material carefully. The study questions provided are not meant to cover all aspects of the book but, rather, to address selected ideas we thought might warrant further reflection. Most of the questions in this Study Guide are ones you can think about on your own. But you might also consider pairing with another colleague or a group of people who have read (or are reading) The Multiple Intelligences of Reading and Writing. Do a current review of the literature in an educational database like ERIC, typing in the search words “love of learning” or the equivalent. What connotations do the word “genius” bring up for you from your past? Look up the word “genius” in the Oxford English Dictionary and examine how its meaning has changed over the course of the history of the English language. If the term “multiple intelligences” were placed on a continuum from 1 to 10, where 1 = awakening the love of learning in students and 10 = helping students prepare for standardized tests and other curricular expectations, where would you place it, and why? Think back to your original reasons for getting into education. Can you place yourself somewhere in the past at the moment when you decided to become an educator? What were the feelings, ideas, impulses, and associations that prompted you to help children learn? Put that experience somewhere on the above scale from 1 to 10, and discuss why you put it there. Would it have made a difference to you if the title of this book had been “Awakening Creativity in the Classroom”If so, what would that difference have been for you? Read philosopher Alfred North Whitehead’s essay “The Aims of Education”and discuss whether you feel not enough attention, too much attention, or just the right amount of attention has been placed on the “romance” stage of learning in contemporary education. List the 12 qualities of genius in order of the importance you feel they have in the education and development of the child. Compare your list with those of colleagues, and discuss any differences of opinion. List 12 additional qualities of genius that you feel the child also expresses in his or her life. Discuss your choices. Is an additional list needed for adolescents? Do a review of the literature on a database such as ERIC or PsychInfo for each of the 12 qualities of genius (as well as the additional qualities of genius that you came up with), and discover what recent research has been done regarding each one. To what extent are each of the 12 qualities of genius in children regarded as negative qualities by teachers and parents? Discuss the extent to which context determines whether a quality will be perceived as positive or negative (e.g., playfulness during recess versus playfulness during a standardized test). If context is key in deciphering the value of each quality of genius, what sort of implications does this have for awakening genius in the classroom? Relate the 12 qualities of genius to Howard Gardner’s 8 intelligences. Do you see particular associations between specific qualities and single intelligences or groups of intelligences? Look up the etymology of each of the 12 qualities of genius in the Oxford English Dictionary with the goal of getting at the deeper meanings of each word. Then relate these deeper meanings to the life of the child. Do you think these 12 qualities of genius are universal in children? How do different cultural influences mediate their expression (or their failure to be expressed)? Make a random list with the 12 qualities of genius intermixed with the following 12 traits: responsibility, discipline, accountability, standards, character, morality, sociability, perseverance, courage, ambition, motivation, and stability. Then have a group of colleagues rank the list of important qualities that a child needs to be successful in life. Which group of words tends to appear more often in the top 12? Discuss the results. Research what is known about the neurological basis for some of the 12 qualities of genius (e.g., are there areas of the brain that are responsible for humor? Imagination? Joy?). Read Marion Diamond’s book Magic Trees of the Mind and discuss the role of the environment in pruning synaptic connections in the brain. If the environment is key in shaping the kind of brain that a child grows up with, what are the implications of this for theories of intelligence and learning that emphasize genetics and determinism in education (e.g., nature over nurture)? If a child does not grow up around creative or imaginative adults, do you think that there are areas of the brain and/or networks of synapses that are literally starved to death due to this neglect? Why or why not? Read Ashley Montagu’s book Growing Young and discuss the concept of neoteny with respect to the 12 qualities of genius. Which of the 12 qualities are particularly important with respect to the survival of Homo sapiens (e.g., which qualities do we particularly need to preserve from childhood into adulthood in order to continue evolving as a species)? Discuss the concept of neoteny in relation to the idea of immaturity. Is it possible for a child to be both immature and neotenous with respect to a given quality of genius (e.g., having the playfulness of the future artist or scientist, but at the same time playing in a way that is developmentally behind the behavior of peers)? If this is true, what implications does this have for our understanding of the concept of “immaturity” with respect to a child’s development? Collect statements from great individuals who have compared in some way the creative work they do with the work of children (include commentaries of people writing about these great figures). Even though Picasso himself made the comparison, do you think it is fair to compare the artwork of children with a great work by Picasso? Isn’t there a world of difference between the innocent naïve eye of the child and the practiced naïve sophistication of the great master? Or are there some important commonalities? Do a review of the literature on the research related to Csikszentmihalyi’s concept of “flow” and its application to children (in particular, children learning in educational settings). Document “flow” events or other peak experiences in learning in the lives of the students you work with (e.g., keep a diary, create flow records, or create “peak learning” portfolios for specific students). In your own school or school district, which of the four familial patterns seem to be most predominant among your students (dysfunctional, disadvantaged, fast-track, or rigid ideology)? What implications does this have for providing appropriate educational programming? What positive measures have already been taken by your school or school district to ameliorate some of the negative influences of home life on the genius of students? How does one confront the attitude among teachers that “There’s not a lot I can do to help this particular kid. He’s already been ruined by his home environment.” How is it possible to dialogue about the home patterns that shut down a child’s genius without falling into a blame-the-parent syndrome? Select one of the four familial patterns and do some action research with regard to it (for example, survey students on the extent to which they feel “hurried child syndrome” or sample attitudes of students on the topic of prejudice before and after the initiation of a prejudice-awareness curriculum project). Think of times when you, as a teacher, chose not to explore topics of great interest with your students because you felt pressure to press on with the curriculum due to concerns with accountability, standards, and standardized tests? What thoughts do you have about this as you reflect on these specific instances? What percentage of students in your school or school district have been labeled or tracked on the basis of their abilities? Has this number increased or decreased over the past five years? Look at the students have who been given a deficit label or placed in a lower track and assess the extent to which they have one or more of the 12 qualities of genius discussed in this book. Develop an action research project that uses Csikszentmihalyi’s Experience Sampling Method with students (where you ask students to write down what’s going on in their minds randomly throughout the school day). One suggestion: have students fill out a form where they rate on a scale of 1 to 10 the enthusiasm they are feeling for the lesson plan at that moment by placing a line on a bar and then anonymously handing in the form. Discuss the implications of the results with colleagues. Talk with students about how their own attitudes, values, and ideas have been shaped by the media around them. Initiate a media awareness program at school which explores the various techniques used by different media to manipulate students’ awareness, attitudes, feelings, and ideas to buy products, view certain programs, or think in certain ways about life. Compare the writings and drawings of students in today’s world with those of twenty-five years ago (if possible, compare current student work with archives of students’ work from other decades at the same school). To what extent do you believe there has or has not been an erosion over that period of time in the students’ abilities to create their own unique metaphors and images versus using those of the media? Sample the conversation in the teacher’s lounge over a period of a week and determine what percentage of the conversation involves genuine excitement about the learning/teaching process, excitement about the content of the curriculum, or other displays of passion for learning about the world. Discuss the results with colleagues. Create a “Teacher as Passionate Learner” program in your school where teachers get together to discuss things they are excited about learning (reading, travels, hobbies, etc.). See list on pp. 53–55 for resources and activities that could provide a basis for new, passionate learning. Have teachers gather regularly to share “genial” or “genius awakening” experiences they are using in the classroom. See pp. 56–65 for sample descriptions of the kinds of experiences and climates that might be initiated in the classroom. Initiate a project in your classroom, school, or school district that attempts to identify and describe all of the strengths, talents, aptitudes, competencies, intelligences, and other positive attributes of all the students. Awakening Genius in the Classroom was written by Thomas Armstrong. This 81-page, 6" x 9" book (ISBN 0-87120-302-2) is available from ASCD for $8.95 (ASCD member) and $10.95 (nonmember). Copyright 1998 by Thomas Armstrong. To order a copy, call ASCD at 1-800-933-2723 (in Virginia 1-703-578-9600) and press 2 for the Service Center. Or buy the book from ASCD's Online Store. Copyright © 1998 by Thomas Armstrong. All rights reserved. No part of this publication—including the drawings, graphs, illustrations, or chapters, except for brief quotations in critical reviews or articles—may be reproduced or transmitted in any form or by any means, electronic or mechanical, including photocopy, recording, or any information storage and retrieval system, without permission from ASCD.